We study analytically the joint dispersion of Gaussian patches of salt and colloids in linear flows, and how salt gradients accelerate or delay colloid spreading by diffusiophoretic effects. Because these flows have constant gradients in space, the problem can be solved almost entirely for any set of parameters, leading to predictions of how the mixing time and the Batchelor scale are modified by diffusiophoresis. We observe that the evolution of global concentrations, defined as the inverse of the patches areas, are very similar to those obtained experimentally in chaotic advection. They are quantitatively explained by examining the area dilatation factor, in which diffusive and diffusiophoretic effects are shown to be additive and appear as the divergence of a diffusive contribution or of a drift velocity. An analysis based on compressibility is developed in the salt-attracting case, for which colloids are first compressed before dispersion, to predict the maximal colloid concentration as a function of the parameters. 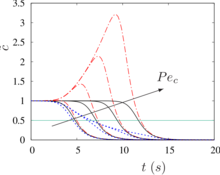 This maximum is found not to depend on the flow stretching rate nor on its topology (strain or shear flow), but only on the characteristics of salt and colloids (diffusion coefficients and diffusiophoretic constant) and the initial size of the patches.